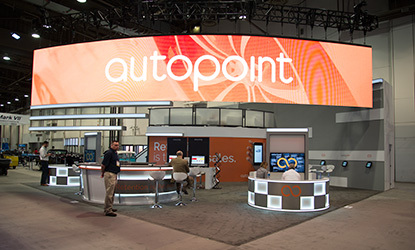 When Autopoint came to us requesting a large LED wall that could really “pop” in the forest of signage…. Goldwind a leader in clean power was looking for a “green” solution for the WindPower Expo. What better way to stay “green” than to…. Dubbed “Best of Show” at NRF 2015 this 30×80 exhibit for PayPal & Ebay, Inc. was a show stopper…. Magento a worldwide leader in online store fronts wanted a “Tower of Power” for the National Retail Show in NYC….. There are a vast array of reasons your company, whether it’s a small, locally owned business or a large, international corporation, might need convention booth rentals. When you purchase one of our display booth rentals, you can be certain you will be getting an exhibition booth rental that will help you stand out at whatever venue you happen to be presenting at. When you need quality trade show exhibit rentals you can rely on, look no further than our trusted team of experts. Our trade show exhibit rentals are specially built to your specifications so your custom exhibit rentals will be the full realization of your vision in its truest possible form. No matter what kind of rental booth you have in mind, if you are able to get it down on paper, we will be able to construct it for you. Whether you need custom rental exhibits or custom trade show booths, you have no need to look any further than the team at Structure Exhibits. We are passionate about helping you fully realize your vision and making sure your custom booth stands out at every trade show and convention your company is going to attend. For more information on Structure Exhibits, contact us by phone at 888-633-4162 or at our office at 4548 Calimesa Street.